It happens to all of us – something we own becomes obsolete for whatever reason, and we’re left wondering what we should do with it. We know it still possesses value for someone out there, but for us, its job is now to collect dust. We could give it away, but that feels like depriving ourselves of some value. After all, it’s in good shape, and we paid a decent amount to get it in the first place. We could sell it, but that sounds like a lot of work, and we’ll probably get peanuts for it in return. Well, just like this can happen with that couch you want to get rid of or the unused car sitting in your driveway, it can happen with used shelving clips. 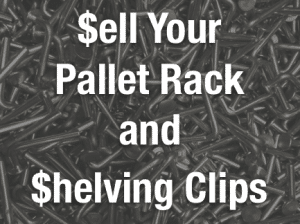 That’s right – there is a market for the clips that go with your pallet rack or industrial shelving. Of course, you might be wondering how it can be any different with shelving and pallet rack clips. Surely, it’s a hassle to sell your shelving clips, right? In fact, it’s actually pretty simple when you sell them to Shelf-Clips.com, and you can get pretty good compensation for doing it, too. 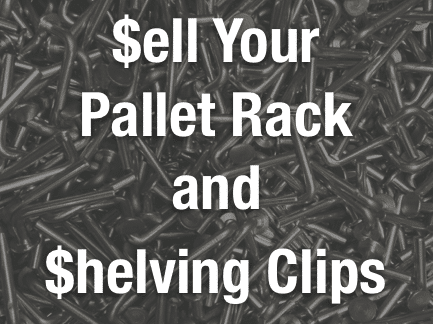 In order to sell your pallet rack and shelving clips to Shelf-Clips.com, you’ll need to take a few basic steps. The first of these steps is to try to identify which type of clip it is. If you already know what type of clip you have, skip to step two. There are a few ways to go about this. Some clips make it easy by printing the manufacturer name on the surface of the clip itself. However, many manufacturers make more than one type of clip, so simply looking at the clip isn’t always enough. The most reliable way to identify your clip is by using Shelf-Clips.com’s handy pallet rack and shelving clip identifier. After you’ve identified which clip you have, you’re going to want to count how many clips you have. If you have a relatively small number of clips, you may choose to simply count them out by hand. If you have a whole lot of them, however, you might want to think about weighing them out. This will give you an exact number of clips while eliminating human counting error. After speaking with you, we’ll give you a quote on what we can give you for your clips, completing the process. All in all, it’s painless and relatively hassle-free, and you can get rid of those clips you no longer need. Give us a call today, and we’d be happy to answer any questions and help walk you through the process. Previous PostWireway Husky Pallet Rack ClipNext PostWhat Kind of Clips do I Need for my Shelving?